Happy Tuesday loves! Or I guess Monday to those lucky folks who had off yesterday! I've been trying hard to be a good girl and get back to the gym lately and I'm proud to say that while I haven't gone as much as I used to I have gotten 2 days in a week for the past two weeks. Baby steps, right? I'm hoping that pretty soon I'll be back to my regular 3-4 days a week but I'll take what I can get for now. Now that I'm back to working out either before or after work one of the must have items in my gym bag is this Dove Dry Spray! I am always on the go, even on days I don't go to the gym, so wearing black could always be a bit tricky. No one wants to be half way out the door only to realize their deodorant left white marks all of their black outfit. If you're like me, you don't have time to run back in and change so having a deodorant that goes on clear and dries super fast is a game changer. No more waiting for your deodorant to dry, worrying about residue and white marks and it keeps you dry and fresh for up to 48 hours! It's such a relief to know that Dove has girls (and guys) like me who are always on the run covered and it's great not having to worry at the gym if my deodorant is holding up. It couldn't be easier to use either; simply shake the container, pop off the lid, point and spray! Just as a warning, it does go on a bit cold so that was an initial shock to me but once you get passed that you're good to go and I love how it keeps you feeling moisturized all day. I don't think I'll ever be able to go back to stick deodorants again after using this! I was given a bottle of Dove Dry Spray in exchange for my review, as always all opinions are 100% my own. I'm also trying to get back into working out. I used to go 6x's a week and now I'm at 1-2x's if I'm lucky! It's so hard with work taking up so much time lately but I'm committed to trying! Baby steps is the key :) I'm also trying to work back up to working out 5 days a week! I've wanted to try this spray, thanks for your honest feedback! I like spray deodorants a lot especially for keeping in a gym bag for a quick refresher! I have this Dove spray and LOVE it! Great for on the go! I love Dove deodorant so much! I'm glad you're getting back into the gym, it's the best feeling! OOh, I've been curious about this too! I use the Dove regular old fashioned kind in the same scent but have been wanting to try this. Does you feel like it works the same? 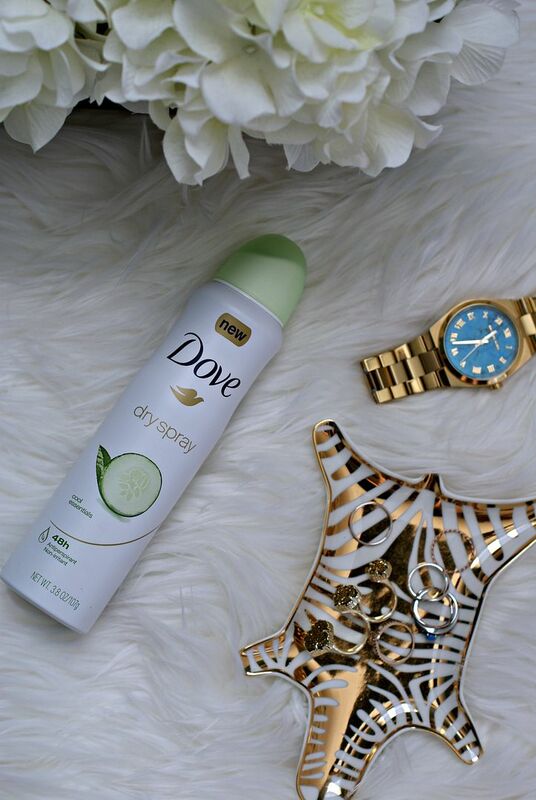 I use dove deodorants but haven't tried this dry spray. Definitely trying out next cause nobody got time for deodorant stains ruining outfits! I got this Dove dry spray too and looove it so far! I've been a lifelong user of dove deodorant and I'm notorious for forgetting to put it on until after my clothes are on so this is a game changer! I always use Dove because it never leaves marks and I don't feel the need to reapply every half hour! I'm a huge fan of dry sprays! I typically use the Degree one, but I'll have to try Dove when my current bottle runs out. I've never even heard of this sounds fantastic especially since I never know where I'm headed after the gym! LOVE how you were able to workout and work today - wish I could do that! I'm obsessed with deodorant sprays now... they're wonderful. I love how quickly they dry! And Dove's is great! I vary my workout times to fit my schedule, it is so hard to fit it all in! I love dove dry spray and haven't bought one in awhile, I need to add to my Target list! I hate the deodorant marks that get all over my black clothes! The dry spray sounds like the perfect way to stop that! And you have to start somewhere when you're getting back into working out, and two days is better than no days! Totally agree, especially after the holidays it's tough to get back in a routine but that's the goal! i love this stuff! great for on the go! This product sounds awesome if you're on the go! I LOVE Dove products! Thanks for the great and comprehensive review! Dove has such wonderful products and this sounds like another great one! This sounds great! So handy for when you are in a rush! This was just the extra motivation I needed to get back in the gym-and I think I will be throwing that dove spray in my bag on the way! Thanks for sharing! I have been wanting to try a spray... thanks for sharing! Awww love this post so much! I am a huge dove lover they have such great products! i'll have to check this out! seriously, nothing is worse than discovering deodorant marks on your clothes. good job on the gym girl! I feel like I always fall off my workout routine around the holidays. I'm trying to get back on my pre-holiday schedule too -- awesome job with yours! Love the spray deodorant, it's so quick and easy!